Yesterday's post about the Advanced Style Eccentrics drew many comments about the intention of "not looking invisible" and "not wearing boring clothes". OK, nobody puts (50+) baby in the corner. If you don't want to be invisible, here are some pungent, assertive choices. I would not wear all of these (that's me in the corner in the dove gray cashmere) but each garment carries the message that the wearer has not given up. Most examples are on the expensive end; you can find cheaper, but quality is iffy. Check Zara if you want to be noticed for only a season and can wear narrow cuts and short lengths. Stella McCartney pleated silk citrus-print skirt, much photographed and actually owned by one of our blogfriends, the lovely Mardel. Expensive, yes, (£675 at Brown's), and recognizably Stella. Are peonies not the operational definition of joy? D&G stretch twill peony-print dress, $515 from Netaporter. Did you remember to pack the champagne, my love? Marc Jacobs woven-silk jacket, a precisely tailored silhouette tweaked by merry flowers that read as geometry till you look closely. Price, £819, from Brown's. More junk is sold under the "wearable art" label than "slimming". 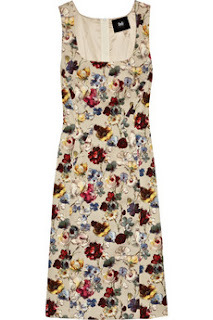 If you enjoy painterly effects, consider the Rochas jacquard sheath. 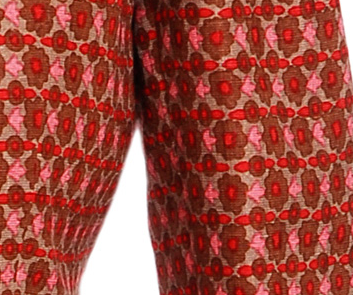 Look at how the pattern flows to the hem; the eye travels to your pretty legs. Price, $1,645 from Barney's. You'd like to take my photo, Mr. Cunningham? Kiss of the Wolf's shibori top is arty, but a Japanese watercolour caress instead of an op-art punch. Each piece is handmade; contact Kiss for price. Lightweight foil lambskin Bradley jacket by Lafayette 148: light, versatile and not black. Wear it with shades and let people wonder who you are. Price, $998; wide size range. Try the cheek of traffic-stopping red in an absolutely classic cut. You won't want to toss it out after a year and it will last for decades. 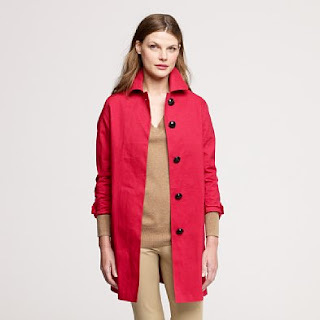 MacIntosh Kilmany coat, $950 from J. Crew. Merino confetti-stripe sweater: the mellow mariniere goes glam with scattered sequins. Definitely picks up a pair of jeans. From J. Crew, $148. Could we have a table that's a little more private? No item here is over the top eccentric, at least if worn with a neutral accompaniment. Each was chosen to get looks, to refute that dreaded invisibility. Post could be titled "Minimalist goes crazy". I invite you to send links to what you'd pick, and never mind price. The Passage welcomes window shopping! Oh, the silver lambskin jacket, without a doubt! Especially if I could have a matching Porsche Carrera. That can be arranged, can't it? Oh Duchesse, your captions are priceless!!! 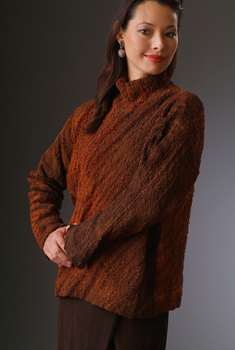 I'm loving that shibori sweater YUM, and the metallic jacket. See, I knew we were just arguing semantics. 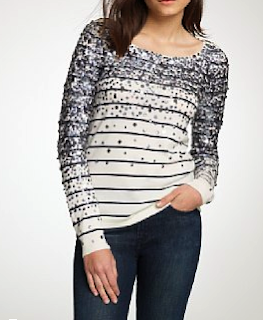 ;-) That sequined sweater is a great example of what I'm talking about when I say "a little bit of whimsy." I saw that J.Crew sweater in the latest catalog and instantly coveted it. Classic with a twist. And I love matte sequins in the wardrobe for a touch of interest without being flashy or gaudy. Nice post. I keep a collection of inspirational photos on my computer, and one of them is of George Mann and his wife, courtesy of Advanced Style. I'm keeping my eyes peeled for a dress like his wife is wearing, so that I can dress like her when I grow up. I'd wear some pieces from Dolce and Gabbana Spring 2011. Lace, and I'd layer them. A white blazer, over a white lace dress, over white pants. Then blush-colored pumps. A small straw hat, on a sunny day. My hair, by then even more gray, in a pony tail. http://www.style.com/fashionshows/review/S2011RTW-DGABBANA. I'd avoid, however, the shorts, and the transparent shirts:). Not to someone else's wedding, of course, but otherwise, seems impeccable and quite attention-getting, to me. Wonderful post, Duchesse. I do believe that one can dress in clothes that get you noticed...but in a good way. The Rochas dress and the lambskin jacket are both amazing, but tasteful. And I rather adore the citrus skirt, it would be perfect for Boca Raton or Palm Beach with a camisole and ballet flats. Evelynne: Love love love her! To me there is a world of difference between her ensemble and many of those worn in the video. 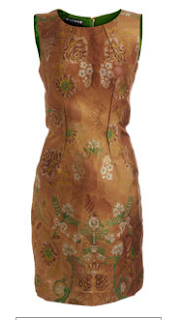 Dress might be Etro? 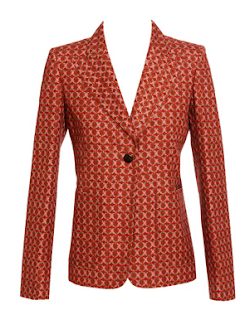 A simple classic cut in a pattern reminiscent of many Italian textiles. A "resort/lady" look completed with turquoise and coral jewelry. Belle: That citrus skirt will be unavoidably Spring '11 but who cares? Standout piece from the consistently strong McCartney. Deja Pseu: Intrigued by the silk/poly fabric, would like to see and feel close up. Thank you! Admiring the foil jacket and the green dress! Ladies, I find the clothes that get you noticed are the flattering, quality ones. They stand out in the crowd of I don't give a damn that most people wear! Anonymous: Are you a man? For some reason, I seem to sense that- perhaps because of the "ladies" form of address. Terri: A lot of women are loving that jacket and I am happy to say it comes in 0 to 18! I really like the red coat. Very tempting, except for the price. I did go to the J Crew site and see the other coats they are offering by that maker. Interesting. I also like the gingham one. 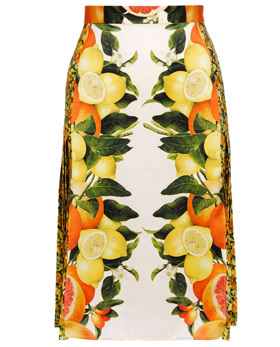 Oh, just love that Stella McCartney citrus skirt! That Rochas dress is beautiful, but way out of my price range! I was going to look for a pattern to make myself a couple of frocks for work for the summer so I will see if I can find anything like that in style and/or material. Thanks for the mention. If only it would warm up, I could wear mine. The shibori top looks interesting. I remember Kiss of the Wolf's early stuff as being more "artsy craftsy", this may be promising evolution. I went to J Crew this weekend looking for that sweater but they didn't have it in the store. I shall have to order, but I have such issues with J Crew; some of their stuff is fabulous and some is just shlock. Or perhaps it is just me. The metallic jacket is just fabulous.